I was introduced to Cafe Max when we first moved to Dallas by my best friend Tina. And since our move five years ago, I can honesly say without a doubt, this is my favorite place to eat salad. I always get the salad trio. The chicken salad is DELICIOUS! Flavorful, sweet (but not too overpowering). I also get the Ceasar salad (the dressing is really good), then I get the pasta salad which is so rich and tasty. If you live in the Dallas area I stongly recommnend stopping by Cafe Max, they are moderately priced at about $10 dollars but they give you SO MUCH FOOD! However, if your looking for the recipe on their chicken salad I FINALLY found it!! It’s a faboulous salad that is super simple, elegant and flavorful. Trust me it’s so good and perfect for any special brunch occasion. 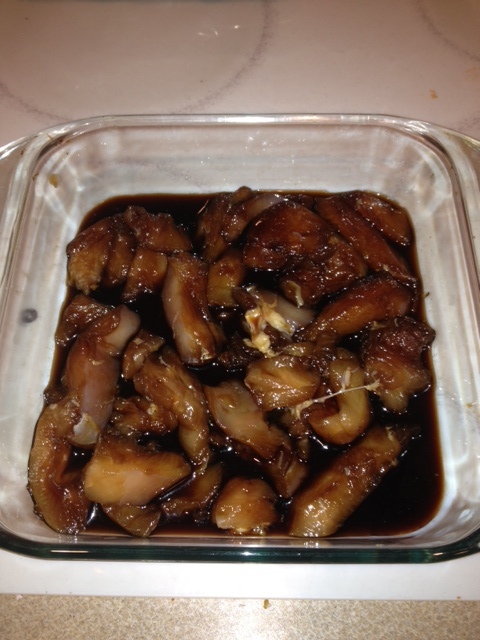 Mix soy sauce, brown sugar, and pineapple juice. Marinate chicken in mix in a plastic bag or dish for atleast an hour chilled. Once chilled bake chicken and mixture in a baking pan at 350 degrees for 30 minutes. (Make sure chicken cooks all the way through). Previous Homemade Laundry Detergent….IN THE MICROWAVE!!! Next Window Cleaner…bye bye Windex!! 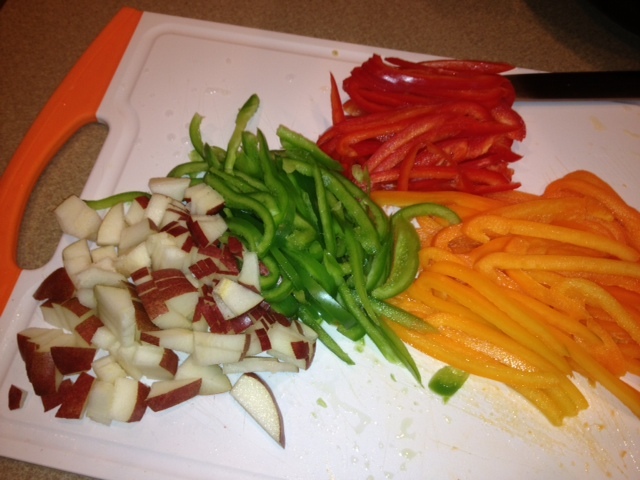 Would love to see the pasta salad recipe as well! The pasta salad is hands down my fav! Do you know the recipe for it? That’s also a favorite!! Unfortunately I don’t, but please share if you were come across the recipe!!! Thanks!! Can I say I love you for this?! I moved away from Plano a couple of years ago and have been looking for this for a while. I just came across this today and couldn’t be more excited! I love Café Max! BTW, if you come across their ceasar salad dressing, could you let me know! It’s the best I’ve ever had! Thank you thank you thank you! Lol!!! I LOL it’s a great recipe and one of my all time favorites!!! I definitely will post the recipe if I come across it. 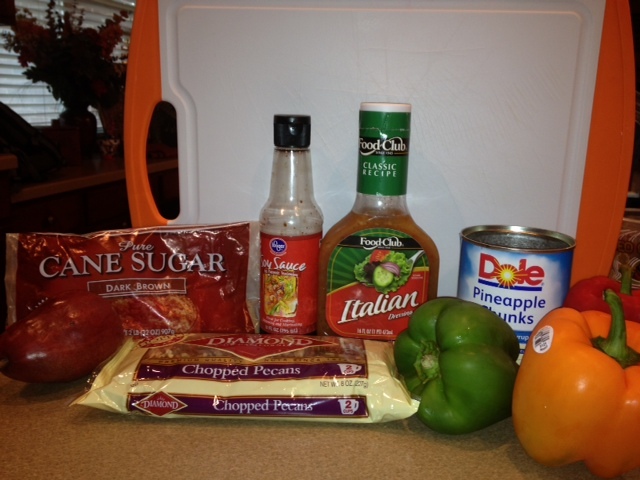 Let me know how this recipe works out for you!!! what kind of Italian dressing do you use? Good Seasons? Wish Bone? Good seasons! Let me know how you like it! I can always taste sesame oil in it and there is also a small amount of cilantro….I eat at Cafe Max all the time. I was introduced to Cafe Max 3 weeks ago. It is absolutely wonderful. I went again yesterday for chicken salad and cucumber salads. I would love to see the cucumber salad recipe. I know there is cilantro in it and I assume Italian dressing. What am I missing? 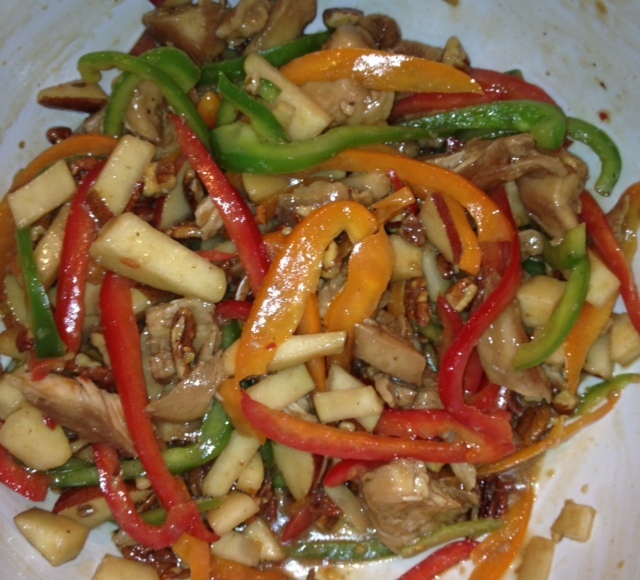 do you cook the peppers and pear with the chicken? Thank you! Thank you! I will be making this Sunday for a baby shower in Florida. I grew up in Dallas and Cafe Max has always been my fave!! I yearn for the trio: Pasta, chicken and Caesar salad with a carrot muffin and the To.Die.For Spiced Iced Tea!! My heart thanks you for sharing and please post if you find recipes, Cafe Max needs to expand out here! Thanks. What type or brand of caesar lettuce? Also, do you have a receipt for the great tasting caesar dressing? Been looking for this recipe for a long time. Just made it and it is awesome. I added halved grapes and cilantro…so ridiculously good. Thanks for the recipe!